European Connection Imports (ECI) has been in business since August 1985, located in Scranton Pennsylvania. Founder and CEO Tony Boldrini and his wife Pina Boldrini have been in been in the custom spray booth business for over 25 years and has a wide array of knowledge surrounding this technology. ECI is the exclusive importer of CMC Spray Booths since June 1988, with the first booth sold in Philadelphia Pennsylvania. During the early 1990’s, Tony Boldrini along with CMC introduced, and application that became the basis for the spray booth industry. This technology was the leader in its field giving the industry a guideline to develop their products. 1989 Baltimore Maryland - ECI designed and installed the largest above ground prep station production line that still in operation after 21 years. 1991 Las Vegas – NACE introduced the Boldrini Operational Safety Spray Systems (BOSSS). This was the first industry introduction of multiple line spray booths. Other manufacturers subsequently copied this product strategy. Triple prep station heated and bake. Booth doors as external door for the building. 1993 Dallas Texas – at NACE, ECI introduced the first Multiple Prep Station Heated for 3 or more cars under one ceiling and with one air make up unit. This has now become an industry standard. 1994 Las Vegas – at NACE ECI introduced the Multiflow Spray Booth Technology, a system to change the speed of the air to treat water-base paint. This has now become an industry standard. 1994 – ECI introduced the First Pneumatic Inside Ramp in order to maximize floor space inside the spray booth. Since 1995 ECI has designed and installed custom spray booths with double or triple spray booths connected together in an assembly line format in order to increase production. 1999 Atlanta Georgia – at NACE ECI introduced the first electric heated coils spray booth in the automotive industry. On the showroom floor at NACE, for the first time, the booth was running at 150 degrees Fahrenheit for the length of the 3-day show. All the CMC electrical booths installed continue to operate in California, Nebraska, Ohio, Arkansas, Arizona, Georgia, Florida and Nevada. 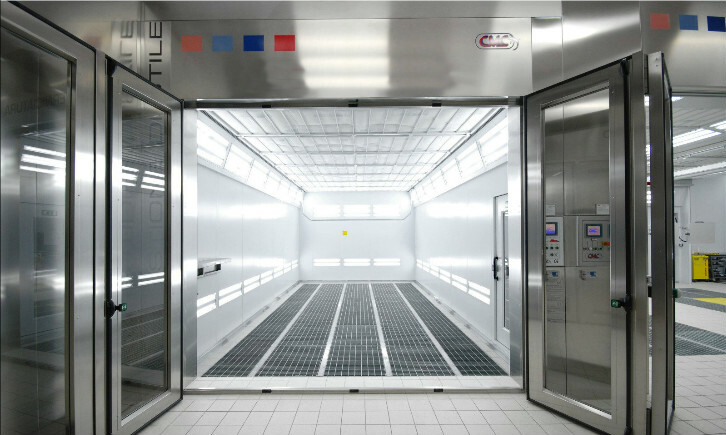 2000 Arkansas – ECI installed the first Hybrid Gas/Electric customer spray booth. 2000 Orland Florida –At NACE, ECI introduced the first motorized Roll-Up Curtains divider between prep stations with front or side loader automatic roll up entrances. 2006-2010 – ECI reevaluated the automotive refinishing market’s needs for new and innovative solutions to meet the requirements of auto body shops paint processes based on changes in the business. ECI looked at current available paint booths from multiple suppliers and the costs and benefits afforded to varying types of auto body shops. The result was the introduction in 2010 of INOX Series Paint booths and the EquairlizerTM Paint Application System. to fit the Body shop of your dream as we did for the past twenty five years for other customers. Bob Davidson Ford - Baltimore MD. West Coast Chopper - Long Beach, Cal. WE ARE READY TO BUILD YOUR SPECIAL PROJECT.